Anze Kopitar Bobblehead Giveaway Night. The last Anze Kopitar Bobblehead Giveaway Night at the Staples Center was on Saturday, March 16, 2016, at Staples Center against the Calgary Flames. Fans in attendance received a Los Angeles Kings Anze and Gustl Kopitar Bobblehead presented by Mercury Insurance. Kings fans, celebrate one of the most anticipated Kings Promotional Giveaway nights of the season. Bob Miller Bobblehead Giveaway Night! Bob Miller BOBblehead Night Saturday, January 13, 2018, at Staples Center. The Kings will face the Anaheim Ducks in their Freeway Face-Off series. LA Kings fans, take Tanner Pearson home with you. Tanner Pearson Bobblehead Giveaway Night on March 17, 2018. Watch the LA Kings and New Jersey Devils at the Staples Center and take home your very own Tanner Pearson St Patricks Day Bobblehead Giveaway. Kings fans, celebrate one of the most anticipated Kings Promotional Giveaway nights of the season. Kyle Clifford Bobblehead Giveaway Night! Kyle Clifford Zombie Bobblehead Night Saturday, October 14, 2017, at Staples Center. The Kings will face the Buffalo Sabres. Kings fans, celebrate one of the most anticipated Kings Promotional Giveaway nights of the season. Tyler Toffoli Bobblehead Giveaway Night! Tyler Toffoli Holiday Bobblehead Night Tuesday, December 5, 2017, at Staples Center. The Kings will face the Minnesota Wild. How Much Are LA Kings Ticket Prices at the Staples Center? The average LA Kings Tickets price for a home game at the Staples Center is $95.00 per ticket. The average upper-level LA Kings Ticket price is $39.00 per ticket. The average lower-level price is $110.00 per ticket. Average LA Kings Tickets Prices 2016 -2017 at the Staples Center? Here is a look at the average LA Kings Tickets prices for their 2016 – 2017 schedule of games at the Los Angeles Staples Center. Do you know how many Stanley Cups have the Kings won? Do you know how many Stanley Cups the Kings have won? The Los Angeles Kings entered into the NHL during 1967 – 68 regular season and made it the NHL quarter-finals in their first year as a professional hockey franchise. It wasn’t until the 1992 – 93 NHL season the Los Angeles Kings made their first appearance in the Stanley Cup Finals. Under Coach Barry Melrose the Kings finished the season 39 – 35 with 88 points good enough for 3rd in the NHL Smythe Division. In the Division Semi-Finals, they were able to defeat the Calgary Flames four games to two. The Kings faced the Vancouver Canucks during the Division Finals where they won the series four games to two as well. For the LA Kings Western Conference Finals, they faced a talented Toronto Maple Leafs led by Dave Andrechuk and were able to hold them off win a game seven to advance to the Stanley Cup Finals against the Montreal Canadiens. The NHL Adams Division Canadiens were able to make easy work of Los Angeles and defeat them four games to one. Los Angeles Kings Tickets Discount Code Score Amazing Deals! LA Kings Tickets Discount Code is available for their home ice games at the Los Angeles Staples Center. Score tickets to the LA Kings regular season games, promotional & giveaway games as well LA Kings playoff games. The LA Kings are making a run at returning to the NHL Stanley Cup finals this season and have to get through some tough Western Conference and Eastern Conference teams on the way. Score 10% off on LA Kings Tickets at the Staples Center on the games below! At the checkout use our special LA Kings Tickets Discount Code DREW10 on tickets marked BV at get 10% off your order! Save even more by picking up your tickets for free at anyone of our offices! The Canucks are sitting in the tenth spot in the Western Conference and are 5-6-1 on the road. The Kings lost to the Canucks in their first meeting of the season on October 13th 0-3. The Kings versus Canucks game on December 1st will also be Drew Doughty Bobblehead Giveaway night! The Tampa Bay Lightning are sitting in the eighth seed of the Eastern Conference and are 5-5-2 on the road. The struggling Maple Leafs are sitting in the fourteenth spot in the Easter Conference and are 3-5-2 when on the road. The Kings and Maple Leafs have met a total of 143 times with Los Angeles edging them out 62 to 58. The first place in the Western Conference Dallas Stars are 9-2-0 on the road so far this season. The Kings Versus the Stars has the potential to be a NHL playoffs preview. The Avalanche will be looking to get back into the NHL playoff hunt as they are sitting three points behind the Anaheim Ducks currently and are 5-6 on the road. The Kings beat the Avalanche at the Staples Center 2-1 on October 18th 2015. Fellow Pacific Division rivals the Edmonton Oilers will be coming into the Staples Center looking to be spoilers for any opportunities that the Los Angeles Kings might be fighting for with just a handful of games left at the Staples Center before the NHL playoffs begin. The Kings and Oilers have faced off twice so far this season with the Kings getting the best of them in both games so far. The Feb 23rd LA Kings versus the Oilers will be Bobblehead #2 Presented by Mercury Insurance Company. The Staples Center Address is 1111 South Figueroa Street, Los Angeles, CA 90015. Barry’s Tickets offers parking for LA Kings games at the Staples Center form Valet Parking to any one of the different assigned parking lots around the venue. You can learn more about the different Staples Center Parking lots available as well as their location around the venue. Barry’s Tickets is located caddy corner from the Staples Center itself. Located inside the Luxe Hotel it’s a fast, easy and convenient way to pick up or purchase your regular season and LA Kings playoff tickets even after the puck has dropped. You can also pick up all Los Angeles Hockey tickets, as well as your Sports, Concert and Theater tickets from our office free of any delivery charge. Barry’s Tickets may change, add, suspend, cancel, remove or otherwise modify the services, contests or promotions offered by Barry’s Tickets and Barrystickets.com at any time without prior notice. In the event that any changes are made, the revised terms and conditions shall be posted on this website. Please check the latest information posted herein to inform yourself of any changes. Barry’s Tickets is not affiliated with the LA Kings or the NHL. All LA Kings games tickets are 100% guaranteed to be authentic seats and delivered to you on time even on game day. Los Angeles Kings Fans Contest to Ride The Ice! Los Angeles Kings Fans! 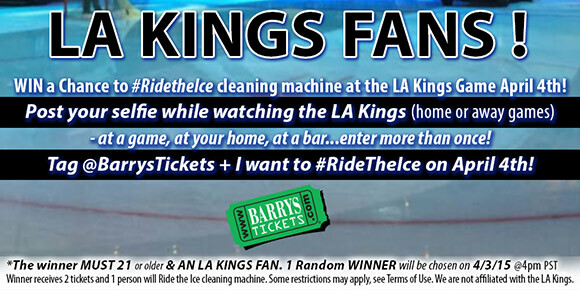 Dont forget still time to enter our Barry’s Tickets Los Angeles Kings Contest to ride the ice! Chance to win a pair of LA Kings Tickets and ride the ice cleaning machine at the LA Kings game either April 2nd or April 4th! Los Angeles Kings Fans can enter on either G+, Instagram, Facebook or Twitter! Just show that you’re a Los Angeles Kings Fan by posting a selfie while watching the an LA Kings game either home or away! You can be at a game, at your home, at a bar or even on the planet Jupiter! It just needs to be a selfie of you watching the Los Angeles Kings! Los Angeles Kings Fans can enter more then once and use multiple social media accounts but each entry must be have a separate game on it. 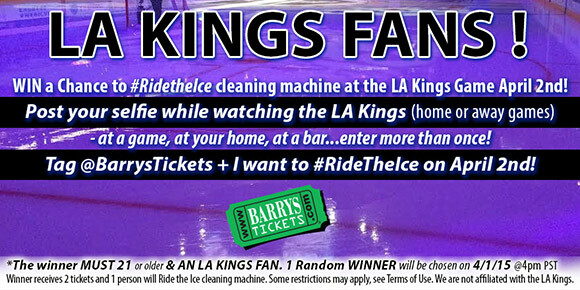 Winners will receive TWO LA Kings Tickets and ONE person will get to ride the ice cleaning machine during the game. Winners must be 21 and over. Barry’s Tickets is not affiliated with the Los Angeles Kings or NHL. See Terms and conditions on BarrysTickets.com if you have any questions. BarrysTickets.com secondary ticketing market data has been used and trusted since 1985 by media outlets including Forbes, The Wall Street Journal, AM570, ESPN and more.